Love the color of your sweater and the bag is awesome. Very very beautiful! Love the jumper and the blouse! Wauw, what a nice outfit! What a great sweater and that bag is awesome! OMG you are making me want a snow day! Too much sun in Cali 😉 LOve this look. You look gorgeous! I love that red top. Such a beautiful outfit! I really love the way you layered your cute blouse and the sweater! So beautiful look!! Love it! Wow that sweater is awesome ! Love the bow over that sweater, Maddie! Such a great look! Nice look, love the sweater!!! I love your outfit ! And your pictures are really great ! I really love your jumper. Love the layering of that blouse with your sweater. Looks greaT! The color red brings out your fair complexion! Yay! So pretty, Ms. Maddie! 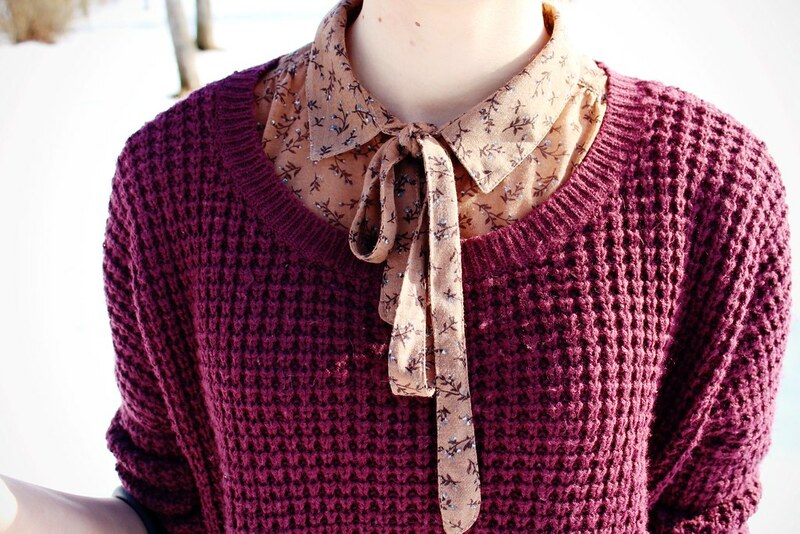 I really like the blouse and knit combination! Lucky you for having holidays, we have only Monday off and I have no school on Monday anyway. XD Good luck with the papers though! That blouse is so cute, dear! the colour of your pull is prettyy ! Lovely photos! 🙂 Your outfit is just perfect! Love the jumper so damn badly! Really lovely sweater! It looks great on you! This is so beautiful! I love the sweater and the sweet printed shirt beneath! love your sweater dear ! So beautiful! Love your outfit & blog! adorable as usual! i love how you layered the collared shirt underneath, it looks really cute! Gorgeous as always! The color of your sweater is really pretty! Lovely cardigan! You are sooo sweet! Love love love this outfit! So beautiful jumper ! WOWW..!!! Your are so pretty..!! i love your sweater..! !